Procter & Gamble Co. Stock at $90: What's Next? A look at the bull and bear cases for the consumer products giant. Consumer products titan Procter & Gamble (NYSE:PG) traded above $90 per share this month after spending all of 2015 and 2016 below that threshold. In a welcome change for long-term shareholders, the stock is outperforming the broader market in 2016 as investors grow more confident about its improving business prospects. But is Wall Street getting ahead of itself? After all, P&G's core market share problem hasn't gone away. The company lost ground across its five product segments for the second straight year in fiscal 2016 as challenges to the core Gillette lineup pushed its share of the razor market down to 65% from 70% three years before. Its most recent quarterly report showed encouraging signs of accelerating growth, but P&G's 2% expansion rate is still near or slightly below the industry. Management said they were happy with the results but that the progress still represented just a step toward their big-picture targets. Market share gains are the foundation of P&G's entire financial model. Without consistently above-average growth, the company can't deliver the high-single-digit earnings improvement -- plus a healthy dividend -- that shareholders expect. Massive direct cash returns, funded by cost cuts and brand sales, have taken up most of the slack from sluggish sales gains lately. However, P&G is done selling off the biggest pieces of its portfolio and, while it's expecting more efficiency gains over the next few years, it will eventually run out of good opportunities to boost profitability by removing expenses. On the other hand, P&G has achieved several important wins lately that put the company in a good position to break out of its growth funk. In removing 100 underperforming brands from the portfolio, for example, management is now free to make targeted investments in support of the franchises, like Tide detergent, Pampers diapers, and Gillette razors, that have the most favorable economics behind them. Overall, management expects the new portfolio will grow at a 1% faster organic growth pace, and with 2 percentage points of higher profitability, compared to the prior setup. 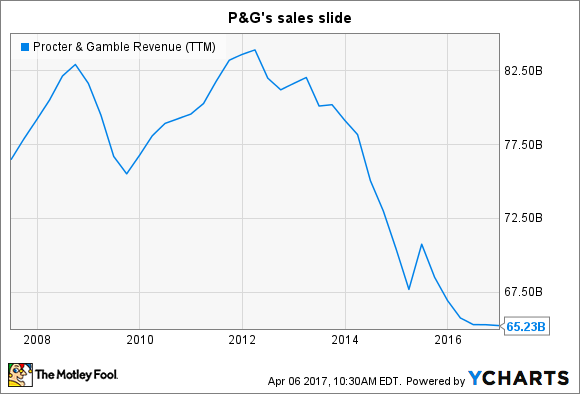 Yes, P&G had to walk away from 15% of its sales base to achieve those relative gains. But the far simpler operations will be easier to steer in response to changing consumer tastes -- ideally allowing P&G to get back to the 3% to 5% growth pace it enjoyed as recently as fiscal 2013. The company is on pace for 2.5% gains in fiscal 2017, which would mark a substantial improvement the prior year's 1% pace. It also implies at least a pause in its market share slide in a few categories. Rival Kimberly-Clark competes with P&G in the diaper segment and is projecting just 2% gains for 2017. The good news for shareholders is that, even if the stock doesn't rally, they'll collect strong cash returns anyway. P&G will send $22 billion to its owners in fiscal 2017 in one of the market's most generous capital return programs. Those aggressive plans run through fiscal 2019, and while they're composed mostly of stock repurchases, P&G's earnings appear healthy enough now to fund a significant dividend boost following last year's 1% raise. Long-term investors have to hope that, by the time the company's unusually large capital return program runs its course, P&G will have found a way back to the broad market share gains it's been missing for the last few years.